This device driver enables you to create your own set of items from the Fanuc FOCAS library, without the need for programming! In addition to monitoring and output a broad spectrum of process data it allows you to dynamically define and change items on a per machine basis with an INI file while CNCnetPDM is running. The following functions are included and can be used and modified in the standard version of this driver. If you need additional functions we can add them at a fixed price. Please contact us to get a quote! Make sure that you have a connection from your PC to the controller and get data, use the fanucdata utility to do so. In case you use HSSB instead of Ethernet please read the additional instructions. If not already done download and install CNCnetPDM, if you don’t have time to study the user manual read at least the quick start guide. Alternatively you can also use our device driver test tool to work with the driver, no need to setup CNCnetPDM.ini in this case. Download the Universal Fanuc driver, if you do not have any Fanuc driver installed extract all content of fanucconf_dll.zip into the folder where you have CNCnetPDM installed. Otherwise it’s sufficient to just extract fanucconf.dll to this folder. Edit CNCnetPDM.ini and add a new device as described in the quick start guide point 6. 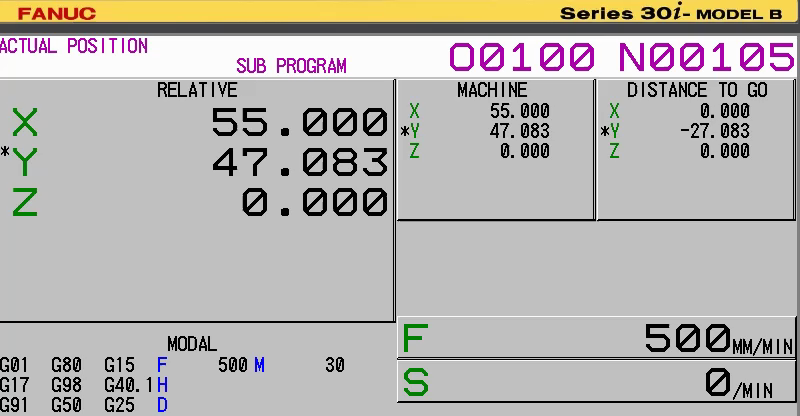 If you already have an entry in section [RS232] for a machine with a Fanuc controller you can simply copy and paste this line and change its content. The parameter (1) is the port you are using for communication with your controller, 8193 would be Fanuc FOCAS standard. The next parameter (2), here 0 tells the driver what connection you are using, change it to 1 if you use ‘real’ HSSB or 2 if you use the HSSB functions of NCGUIDE. Zero and every higher number than 2 is Ethernet. In case of HSSB use 127.0.0.1 as IP Address and localhost as DNS Hostname. Parameter (3) tells the driver how you’d like to acquire part counter values. If you enter 6711 the driver reads parameter 6711 that’s standard on most controllers. Any other number means: Read the number as address from the (PLC) PMC (Area 9). Change parameter above (4) to fanucconf.dll. CNCnetPDM automatically copies the original fanucconf.dll and appends the machine number as configured in the INI file, e.g. fanucconf_1000.dll for machine 1000. In addition an INI file with the same name is created by the device driver, e.g. fanucconf_1000.ini for machine number 1000. E = Machine state 4 would be interrupted mode, changes to 2 if the machine is in automatic mode and runs a program. 3 would be manual, 5 error. Z = Part counter value. If you’re counting in cumulative mode you see the part counter value as shown at the operator panel. You can switch acquisition of specific items on or off by altering the value of Active (0 = off, 1 = on). You can also adjust the name of the item by changing the value of Name, up to five characters are possible. For example if you do not need to acquire tool ID via the modal and the parameter function you can switch one of them off. If you do not need axis positions you can also switch it off by setting Active to 0 in section  of the INI file. It is also possible to force output of items to section 1,2 or 3. Items in section 1 go to group prefixed with ‘O’, 2 = ‘A’ and 3 = ‘F’. Make sure you have entries CollectOrders, CollectFeeder and CollectQuality enabled (=1) in CNCnetPDM.ini. To add or adjust items while CNCnetPDM is running open the INI file with a text editor such as notepad, make the desired changes and save the file. To apply the changes immediately you can click on the machine in CNCnetControl on the left side followed by clicking buttons ‘Close’ (1) and ‘Open’ (2) above the section ‘Devices’. As stated the driver allows you to directly add various functions from the Fanuc FOCAS library. Although many of these functions are pretty complex we tried to make it as simple as possible. short data_type and short length are automatically calculated by the driver depending on the Output item you set in the INI file, here Output item = idata. Many of the Fanuc FOCAS functions are able to output different items or data formats. For pmc_rdpmcrng you can find them in the field with cyan background that describes the structure, here iodbpmc. Only ‘Output item’ e.g. aut, run, motion… is required, see second(!) typedef struct odbst description (section Series 160/180/210) for details. ‘Output item’ = item e.g. alarm or prgnum that should be output, see typedef struct odbdy2 for both functions. For axis positions you can either input faxis for all or oaxis for a specified axis. To check if specific parameters are available on your controller use our tool to read parameters. ‘Output item’ = cdata (byte) idata (integer) ldata (long) or rdata (real data with decimal point). See cnc_rdparam for details. ‘Input parameter 1’ = type, see cnc_modal for details. Please select types with note ‘one by one’. Only ‘Output item’ is required. number outputs alarm number text outputs alarm text for your specific controller type. See cnc_alarm for details. To check if you can get data from a specific area on your controller’s PMC use our tool to read PMC data. ‘Input parameter 1’ = area, e.g. user data (9) see pmc_rdpmcrng for details. Please start with a simple configuration and not too much items at the same time. To do so, you can limit the number of items by simply setting Commands in section [GENERAL] of your INI file to a smaller value e.g. 3 and reload the INI file. To query multiple different values of the same kind e.g. macros, parameters or pmc data you can simply copy and paste a similar section. Please make sure to renumber ALL your section identifiers [N] in the INI file in this case. To add new items please adjust the number of commands in section [GENERAL] in the INI file (max 30), copy and paste a similar section to the end of the INI file, change the section number, save and reload it. Initially use simple functions like cnc_oeestate, cnc_alarm or cnc_statinfo. You can then continue with more complex things like cnc_modal. Please input all parameters strictly in lowercase. If you misspell an output item you get NO output. If you use an invalid command your driver informs you via the log file of the device in the \log subfolder (e.g. log_devicenumber_date.txt). Check this file when testing! If the machine shows a red icon, state disconnected and you get just output E = 0 the machine is not reachable at all. This has nothing to do with Fanuc FOCAS, it’s a network issue, DNS Hostname or IP Address is wrong. If the machine shows a green icon, state connected but you just get output E = 1 the machine is reachable but Fanuc FOCAS does not respond to commands, check your FOCAS setup and the parameters used in CNCnetPDM.ini (esp. Port number). You can also use the tool fanucdata to check if the machine replies to Fanuc FOCAS commands. If you do not get any of the additional items please make sure that CollectOrders is set to 1 in section [General] of CNCnetPDM.ini. If just the axes position is missing set CollectFeeder to 1 in the same section. If you forced items to section 2 also set CollectQuality to 1. If specific items are not acquired check first with fanucdata that you get these values. Also make sure that the numeric section of the item in the device drivers INI file is activated and has an entry for ‘Name’, inactive or items with empty names or incorrect parameters are NOT acquired. Delete all fanucconf_NNNN.dll (NNNN = machine number) files. If you already have created adapted INI files for specific devices do NOT delete the fanucconf_NNNN.ini files.